Many years ago, before B and I were married, he was a regular patron of a small Caribbean restaurant and catering company that served whatever the owner decided to make that day. There were usually 4-6 choices written on a small whiteboard, and B’s absolute favorite was jerk chicken. His heart just about broke when the restaurant closed a few years after we were married. 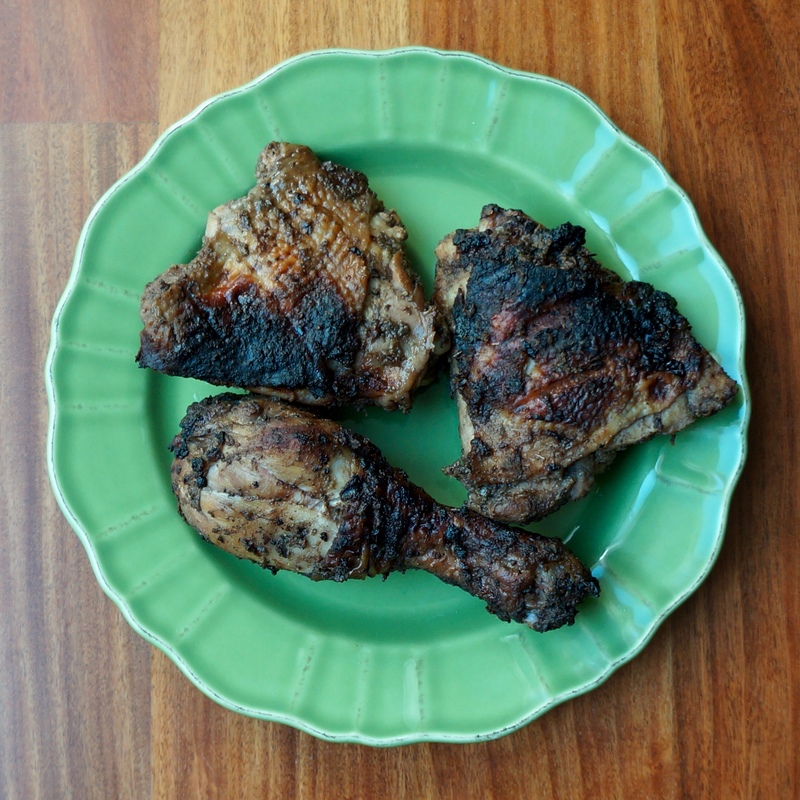 Ever since then, he has been on a quest to find the best jerk chicken (and this recipe beats almost every other recipe he’s tried). Fast forward to my days as a high school English teacher. The school I taught at was a visual and performing arts magnet, and one year they did a Caribbean-inspired musical called Once On This Island. 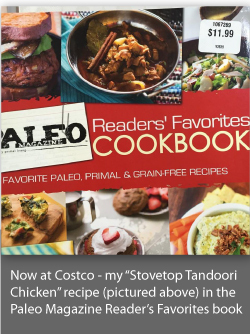 Included in the program was a recipe for Jamaican Jerk Chicken. Over the years, it has become a family favorite, especially during the summer when we can use our charcoal barbeque to get that smoky, charred flavor. 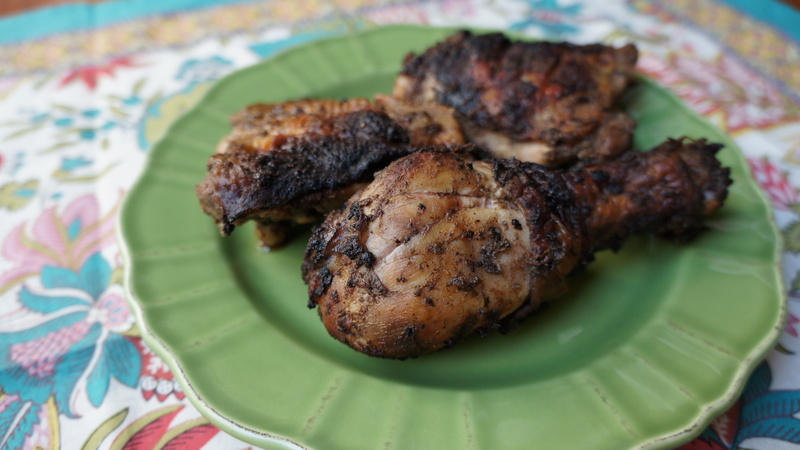 The key to a good jerk chicken recipe is not only the marinade (and this one is amazing! ), but also the “jerking” of the meat. Using a sharp knife or meat fork, you pierce each piece of meat in several places. This allows the marinade to penetrate the flesh and flavor it better, and it also allows heat to escape from the cooking meat without the loss of moisture. Using skin-on, bone-in dark meat also helps retain moisture, and crispy jerk-marinated chicken skin is so delicious! There are several methods for cooking jerked chicken. You will get the best flavor from a charcoal barbeque, but I have also gotten great results from oven cooking and propane grills. No matter which method you choose, be sure to cook the chicken until it reaches an internal temperature of 165F or higher. Make ahead tip: Since this recipe has a lot of ingredients and takes some time to prepare, I often make a double or triple batch, then make marinated jerk chicken freezer packs. Simply add the chicken pieces to a gallon size zip top bag, then pour in enough marinade to thoroughly coat the chicken. Massage the marinade into the meat, then seal the bag, taking care to remove as much excess air as possible. Place the bag into another zip top bag, seal, and label with the contents and date. When you are ready to use your freezer pack, just let it defrost in the refrigerator overnight and follow the cooking instructions below. First, prepare the marinade. Combine the fresh and wet ingredients (olive oil through yellow onion plus the garlic if you’re using fresh) in a food processor or blender. Pulse to combine and finely chop. You want the marinade to be a consistent texture, but some chunkiness is okay. Add the spices (allspice through sea salt plus garlic powder if using dried), then pulse again to combine. Prepare the chicken pieces. Using a sharp knife or meat fork, pierce each piece of meat in several places; this is the “jerk” part and will allow the marinade to penetrate the flesh and flavor it better. Put the chicken in a large bowl or plastic zip top bag. Pour the marinade over the chicken and massage it into the meat. Allow to marinate for as long as possible–at least one hour at room temperature, or longer (overnight is best) in the refrigerator. Choose your cooking method: charcoal barbeque, oven, or grill. If using charcoal barbeque, heat the charcoal until it is white hot, then spread evenly over the bottom of the barbeque. If using an oven or grill, preheat until the temperature is 425F (use the convection setting on your oven if you have it). Remove the chicken from the zip top back, reserving the marinade. If barbecuing or grilling, place the chicken skin side down on the grill racks. If oven cooking, line 1-2 baking sheets with parchment paper and top with a metal rack. Place the chicken on the racks, skin side down. Cook for 15-20 minutes, then flip the pieces over and cook for another 15-20 minutes. If you have more than one baking sheet, rotate the top to the bottom for more even cooking. When the chicken has been cooking a total of 30 minutes, use a meat thermometer to check the temperature of a smaller and a larger piece. Thighs tend to cook a bit faster than drumsticks, even though they are typically larger, so check each type if you have both. Chicken must be cooked to 165F, so go by doneness, not just cooking time. When the chicken reaches 165F, remove from heat and allow to sit for about 10 minutes before serving. While the chicken is cooking, put the reserved marinade in a small saucepan and bring to a boil over medium heat. Reduce the heat to low and simmer for 10-15 minutes, stirring occasionally, until the marinade becomes a thick sauce (add a little water or broth if it gets too thick). Use it as a dipping sauce or salad dressing! Enjoy! I like to serve these with coconut rice and fried plantains. Note: Some of the links in this post are affiliate links that provide a small amount of income which allows me to operate and maintain this website.